DOR on Friday, like usual 🙂 I needed it. My workouts have been terrible. The only thing I can think of is work stress and the fact that i’d added gluten back in to my diet. I am going to limit it as much as possible, but I have to eat it if i’m going to be tested for it (hopefully sooner than later). My new Dr appt isn’t until May 18 and they said no tests that day. Darn. I had planned on leaving work early, but I had too much to do. Plus, not only am I on call for myself (as usual till June), my boss took a long weekend vacation, so I am on call for her too. I was supposed to take the Blackberry from a coworker before I left, but the dang thing kept going off with emergencies all day long. So, yes, I stayed at work, got more done, and avoided taking possession of the Blackberry until I had to. I’m glad I stayed, not just for my peace of mind, but I got quiet time to work on important items. Came home, relaxed, then made dinner. 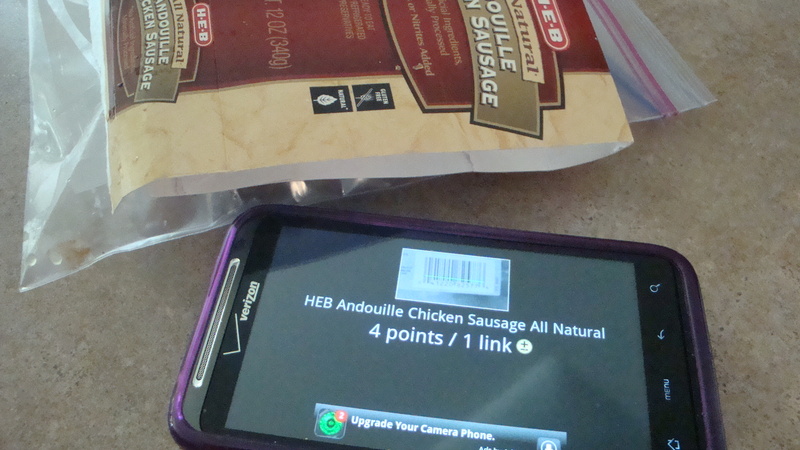 Although I already know how many P+ it is, I scanned my HEB Cajun Andouille Chicken Sausage because it’s fun (and I wanted to show it off). Still trying to get used to my new phone, it’s a huge adjustment from a Blackberry. I LOVE HEB’s chicken sausages, I can only find them at HEB plus, which isn’t a big deal, there is one very close to our house, I just don’t go there often, because it’s not on the way home from work or the gym. The chicken sausage was the main attraction at pizza night! Red sauce, garlic, spinach, cheese, red peppers, onions. Mushrooms on mine, olives on his. 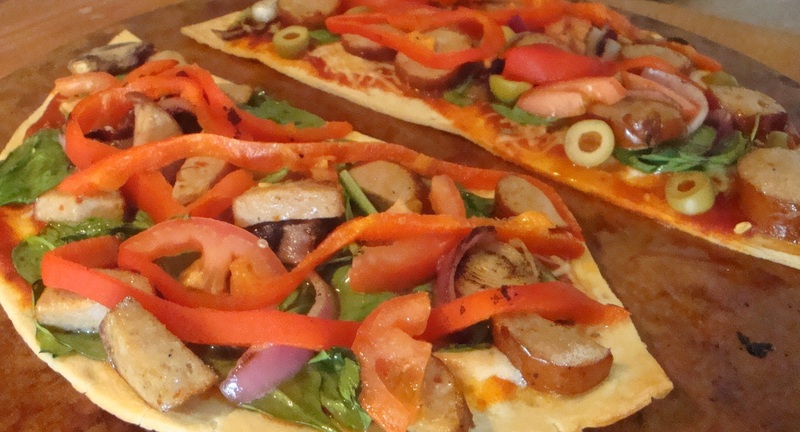 Mama Mary’s thin crust is easy and fab. Once the ones I have are gone, i’ll only be buying them for Dan and finding myself a sub. 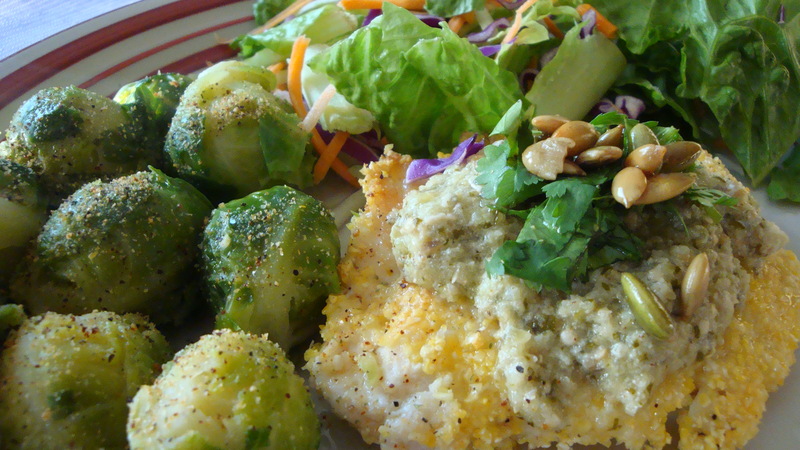 Randomness….I always put Dan’s food, if it’s special, on the right side of the dish. Mine goes on the left. This is because I am left-handed and Dan is right-handed (and I remember whose food is whose that way). Very tasty. (yeah, I may have cut a small slice off before I took the photo, lol!). I was hungry and ate my half and some veggies. Dan left a piece of his. No, I didn’t eat it…but I thought about it. Dan had to take off to have massage therapy on his neck. I went and soaked in my lovely epsom bath, read a magazine, and turned in early. Been busy. At at work conference Monday and Tuesday, so not much to report, other than I worked out before the sessions each day. That and I think I jacked up my right arm. Two new food items. Both tasty and easy. Place tomatillos, onion, 3 tablespoons pepitas, 2 tablespoons cilantro, garlic, broth and 1/4 teaspoon salt in a blender or food processor; process until smooth. Transfer to a medium saucepan and cook over medium-high heat, stirring occasionally, until reduced to about 3/4 cup, 12 to 15 minutes. The mixture will resemble a thick paste. Remove from the heat and stir in sour cream. Set aside. Meanwhile, place one piece of chicken at a time between sheets of plastic wrap and pound with a meat mallet or heavy skillet until flattened to an even 1/4-inch thickness. Whisk egg white and water in a shallow dish until combined. Whisk cornmeal and the remaining 1/4 teaspoon salt in another shallow dish. Dip each chicken breast in egg white, then dredge in cornmeal, turning to coat evenly. Heat 1 1/2 teaspoons oil in a large nonstick skillet over medium heat. Cook 2 pieces of the chicken until browned on the outside and no longer pink in the middle, 2 to 4 minutes per side. Transfer to a plate and tent with foil to keep warm. Wipe out the pan, reduce the heat slightly and repeat with the remaining oil and chicken. Serve the chicken with the reserved sauce and garnish with the remaining 1 tablespoon pepitas and 1 tablespoon cilantro. Easy and tasty. Sauteed diced tofu, a bunch of italian mixed vegetables, spinach, and greek seasoning in canola oil. Added pasta sauce that i’d doctored up with more seasonings, topped with feta cheese. For the ingredients I used it was 8 WW P+ (if you used regular tofu instead of the tofu steak I used, it would be a bit less). Not your typical Easter blog. I don’t think we did anything we usually do, but I was ok with that. Went to the gym when it opened. Had the worst workout i’d had in months. Coincidence that I introduced gluten back into my diet at midnight last night? Maybe, maybe not. The workout was horrible though. Not to mention when I went to foam roll my legs, I had huge knots. Not good. Well I neglected to observe that both Super Target and HEB were closed on Easter. Walmart isn’t. I had to get groceries at Walmart. I hate their produce. They have very little of anything. I made due. I was successful in planning ahead for the Easter bunny though (bought most of the stuff last month). 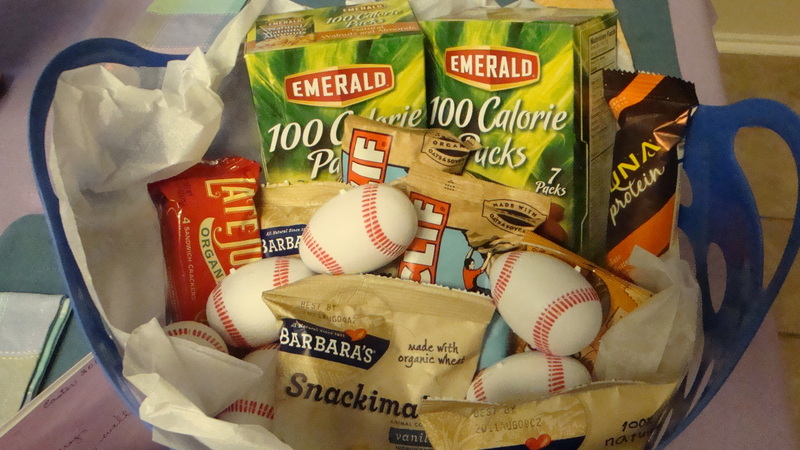 The bunny left Dan this basket of goodies. Only candy is in the little eggs, just small pieces of the good quality stuff. That’s how this bunny rolls 😉 All things he can use for snacks. Come home, get ready, then Dan and I head off to Round Rock for an Express game. It was pretty warm, but a gorgeous day at the ballpark and not very crowded, which was nice. I tried to snap a picture of Dan’s giant hotdog, which was a Nolan Ryan beef 1/2 lb dog. I guess if you are going to have that much dog, it may as well be good quality. There are no photos of my lunch, because Dan didn’t want to play along and I was making a mess. BBQ turkey sandwich with extra pickles and bbq sauce. Because of my stomach being mad, I wasn’t physically hungry, but I knew it was time to eat, so I ate. I’d been wanting that sandwich all lent season, so even though I was wondering about putting gluten back into the diet, I ate it anyhow. Rest of the day was pretty chill. Dan replaced his stereo, I did laundry and grilled chicken fajitas for dinner. I fell asleep on the couch watching the Office with Dan after he finally wrapped up his stereo project for the day. This bunny had a long day and had to turn in early. I woke up early to meet up with my friend. She was running one of her longest pre-marathon training runs in preparation for her 11th full. I was going to meet her for the 2nd half. I hadn’t run long in 2 weeks, which was killing me mentally. We were tagging onto Al’s Ship of Fools, which is a running group (mostly ARC people) here in Austin. I ran a mile from the gym to the park, but didn’t see my friend. Right before 7 am, she came flying from the water coolers….no water. Poor thing just ran 11 miles and couldn’t get a drink. And she was SOAKED it was super hot and humid. Her shorts looked like they weighed 10 lbs. We set off for the 10.71 route through what is called the “hills”. It’s an area mostly west of Mopac back where Hula Hut is and then north of there. Very nice and safe area. I told her to set the pace, I was just going to be happy to make it the distance. I told her if I didn’t feel ok, i’d turn at the 7.71 point (which was another run option for the group that morning). Well about 3 miles in, she got sick. Good thing we’d moved out of the neighborhood and into Tarrytown where there was a Starbucks and then again on the “drag” aka UT campus at another coffee house. Poor thing kept apologizing to me. I was just concerned about her making it back. She insisted on finishing her miles and deemed that run “the worst of 2011”. Honestly, it didn’t matter to me that we were running a pace much slower than usual. I enjoyed her company and I was really glad I was there to get her through it. I know it’s embarassing for people to see you when you are weak, but good friends don’t care about their pace, or stopping to walk with you, or waiting for you to collect yourself. It may have not been the nicest run on the Garmin, but mentally for me, it was a good run. She called me a saint. I corrected her and said, nope, that’s just what friends do. Then home to work in the yard all day. This wasn’t easy, because I was not motivated to do this AT ALL. Rare for me. I like the yard stuff. Had to finish our flowerbed (was put on hold when Dan left town for a week for work). Only took twice as much rock as planned. Expensive project, but it looks great. I’ll try to take photos after the grass gets mowed, lol! We also had to replace our front porch light, which is 20 feet in the air. Lets just say there was an incident in the wee hours on Wednesday morning where a lightbulb, a resident bird, and glass were involved. We (Dan), safely got up there and replaced it. Eventually we got cleaned up and moving. Decided on dinner late, so nothing was really open that was fast (but sounded good). So we opted for Taco Cabana. I love their fajitas. And I also love the rare occasions when Dan will actually share something with me (even though it was fajitas for 2). Then on to Saxon Pub, which is probably my favorite inside music venue in Austin (maybe close tie to Cactus Cafe). It was a special night with Willie Nelson Tribute by one of Dan’s favorite local bands, Uncle Lucius (they performed the whole Red Headed Stranger Album) and then Reid Wilson and his So Called Friends did a few more tunes. Reid chose “All the Girls i’ve Loved Before” as one of his songs and it was so AWESOME. My face still hurts from laughing and smiling. Dan and I are on both ends of the “green” spectrum. I recycle. I have to pester the heck out of him and when he forgets, I dig stuff out of the trash. The stuff I can’t recycle at home, I take to work. When I went to Houston last month and had plastic bottles after the race? I brought them home, because Houston generally doesn’t recycle. No, i’m not a nut, I’ve been recycling since a kid. Easy way to make a difference. I keep reusable bags in my car. I have about 20 others all over the place from giveaways, races, etc. I use them alot. I do still get plastic bags when I buy meat (bags get re-used for the litter box). During a race, I only take gels near a water station. I refuse to throw gel wrappers on the ground not near a trash can. I am huge into water conservation. Dan and I certainly do not agree about how this. The fact that our city has one of the highest water rates in the state does not deter him from that darn sprinkler. I’ll just say, for no water use, just connection, the water bill is $80, but of course we use water and sewage. It’s not pretty. I do what I can in that area, at least we have native plants in our yard for the most part, which take less water. Converting some of our grassy areas into beds and rock gardens right now, less water there too. To observe Earth day, i’m not driving anywhere today. I’ve wanted a compost bin for years. Dan said no, because it would stink. So while the cat is away, the mouse will play…. I had no idea we have 4, yes FOUR drills. 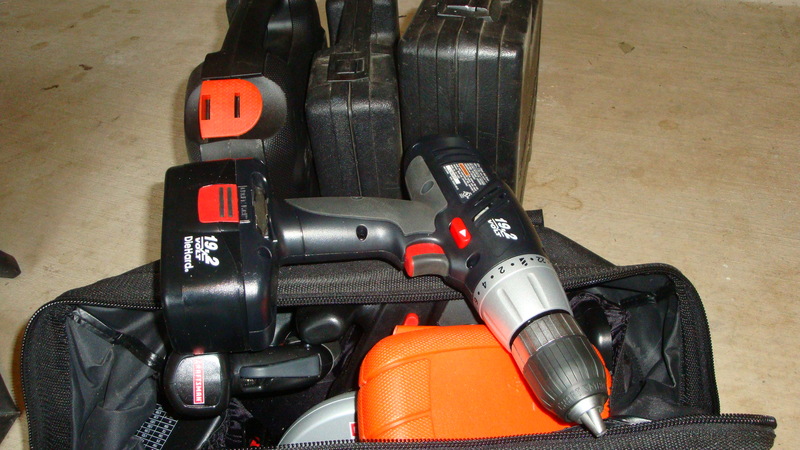 We only use the one in our super awesome tool bag. Someone needs to donate those extra tools. (that someone will be me in the next week if they don’t move). Besides, that one in the middle case is mine and it has bad memories associated with it. No, i’m not joking. Ta-dah! I made a compost bin and it was super easy! And look, my hands are both in 1 piece. But then again, I wasn’t the one that hurt me with the drill 3 years ago. We’ll see how long it takes him to see it in the backyard and roll his eyes at my “hippie” stuff. I am SUPER excited about making compost, I hope I can successfully do it. Just a trash can, a drill, and bungee cords to keep the lid on! I filled it with leaves, grass, some plants I pulled out of the flowerbed over the weekend. Then I started making a mental note of the kitchen waste that can go in there. (tea bags and a banana peel went in there this morning). I’m such a dork, the silliest things amuse me. I’ll keep everyone posted on my eco-project 🙂 Happy Earth Day!